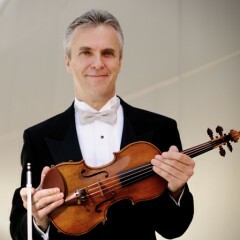 Violinist Martin Chalifour, Principal Concertmaster of the Los Angeles Philharmonic (LA Phil) and a member of the USC Thornton Strings faculty, will perform Saint-Saëns’ Violin Concerto No. 1, under the baton of Paolo Bortolameolli, at the Hollywood Bowl on August 2nd. Chalifour has spent much of the summer as a Valade Teaching Fellow and Valade Concertmaster at the Interlochen Arts Camp in Michigan, working with young musicians, and was featured in a radio interview with Interlochen Public Radio in which he spoke about his teaching philosophy. Chalifour also presented a recital at Interlochen with classical guitarist and Thornton Artist Diploma candidate Mak Grgić (MM ’12, DMA ’16) on which they performed music by Bartok, Kreisler and Piazzolla.